At our Limerick Rock Climbing Wall we have our taster to rock climbing sessions running on Saturday the 17 th from 10 am. At our Hunt Museum base in Limerick City, we are running our 1.5 hr & 2.5 hr Limerick Kayaking Tours, Stand Up paddle Boarding and Boat tours on Saturday the 16 th from 12:30 pm and Sunday the 17 th of March from 2 pm. In Kilkee, we have Windsurfing, Surfing, Kayaking, Coasteering, Stand up Paddle Boarding throughout the weekend. We have our 1.5 Hr & 2.5 Hr Limerick Kayaking Tours from the Hunt Museum. These are very safe tours on our Limerick Kayaking sessions with plenty of team games and fun facts/history about Limerick included! Anyone can take part from the age of 6+ years and no previous kayaking skills or knowledge is needed, (beginners to advance all welcome). The cost with Equipment and the Instructor included the from €35 per person and all that participants need to bring with them are a pair of old runners, swim wear/togs and a towel. 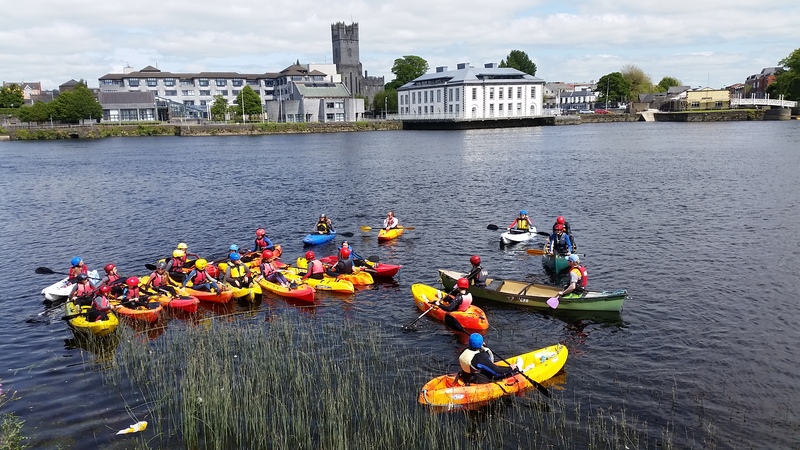 We also offer a shorter Limerick Kayaking City Tour for 1.5 hours, from €25 pp, which has plenty of fun and exciting team games/challenges on the kayaks to keep all very entertained and active and having fun. Or ye could do our Clare to Limerick Kayaking Experience which takes about 2.5 hours and Costs €40 per person at any time/date also? Here, we kayak along the River Shannon starting in either Ardnacrusha, Parteen or Shannon Banks in Corbally in Co. Clare and finish up at the Hunt Museum in Limerick City. On our Clare to Limerick Kayaking Adventure Tour you will learn many key Kayaking Skills and progress up the levels (level 1 and level 2 kayak award). There will be lots of interesting facts/stories and folklore and bring to life the history of Clare and Limerick and fun kayaking games and we will spot for a bit to eat along the way. We also have Stand Up Paddle Boarding, Boat & Sailing Tours / Sessions on the River Shannon now for 1.5 and 2.5 hour tours and sessions (the same prices as above), if this is of interest to ye ? Contact Us on 086 3308236, e-mail: info@nevsailwatersports.com and book your spot to an experience they will never forget!